Viessmann Vitorond 200 boiler, Viessmann Weather Responsive Vitronic 200 Control (computer controlled), First Floor: Stadler (Viega) Climate Panel Radiant Floor System, Second Floor: SlantFin 30 Baseboard Radiators. This is a picture of the Stadler (Viega) Climate Panel Radiant Floor System before being covered. 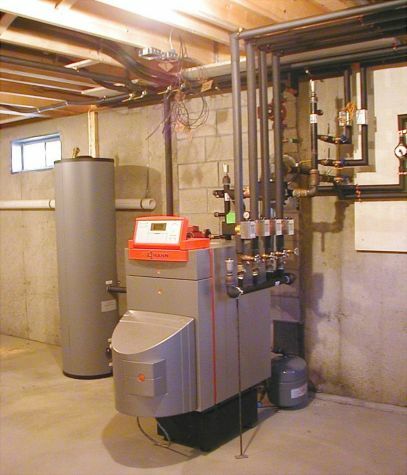 Many homeowners feel they will not have a choice as to what heating system will be installed in a home they are having built. This is not necessarily true. 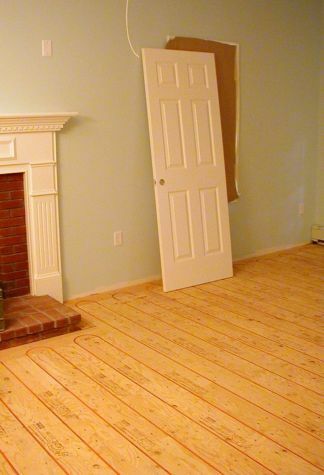 The builder of this home has a radiant system in his own home. The buyers of this home wanted a better heating system and were willing to pay the additional cost to have it. The builder was more than happy to increase the quality of this home and work with an educated buyer.